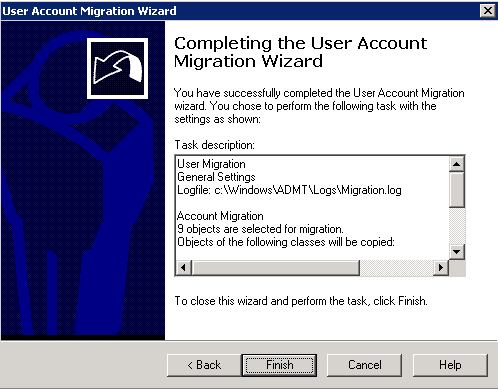 In this post we’ll run through the User Account Migration Wizard to migrate users from the source to target domain. This guide will cover migrating users that do not exist in the target domain, if they do, please wait for the next article which will cover merging user accounts with an include file and/or migrating only the siDHistory attribute (with no other attributes). 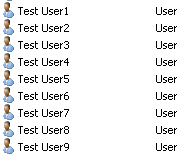 I have created 9 test users in the source domain, which are members of the global security group we migrated in the last series post. 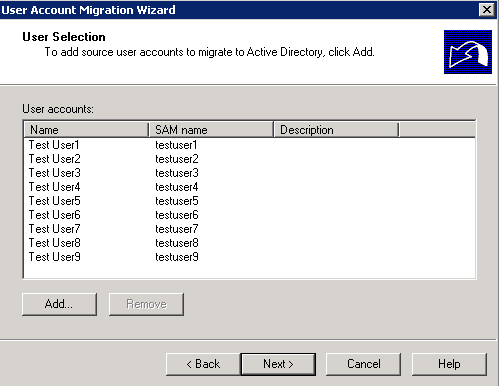 From the ADMT machine, run ADMT and select User Account Security Wizard. 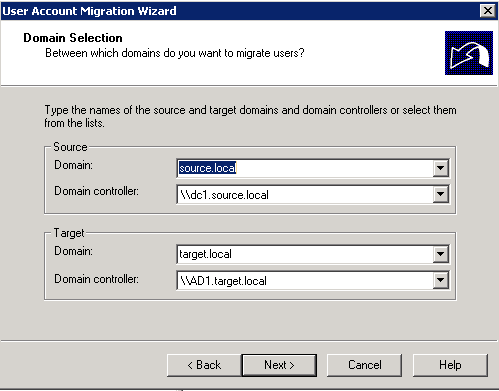 Select users from the domain or use an include file (the include file will be explained in the next ADMT Series post). 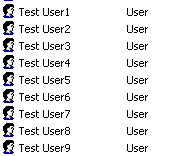 I’ve chosen 9 test user accounts. 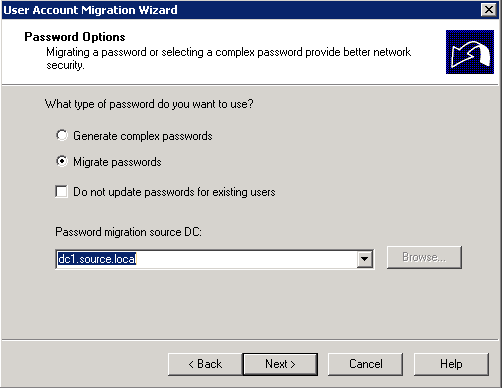 Select Migrate Passwords, and choose the source DC (the DC which the Password Export Service is install on). If you receive the error: Unable to establish a session with the password export server. The Password Export Services is not running on the source server. Go to the source DC and start the Password Export Server Service. Tick Migrate Users SIDs to target domain if you require siDHistory. You can exclude particular attributes of the user here. By default it will pull across all attributes, such as home address, telephone numbers, descriptions etc… If you want to exclude any of these from being migrated across, tick Exclude specific object properties from migration and select User in the object type box. 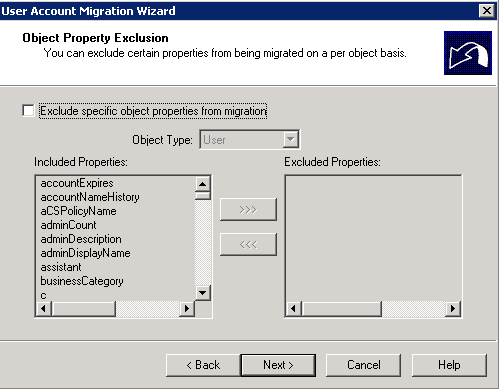 Move any user properties you want to exclude into the excluded properties box. 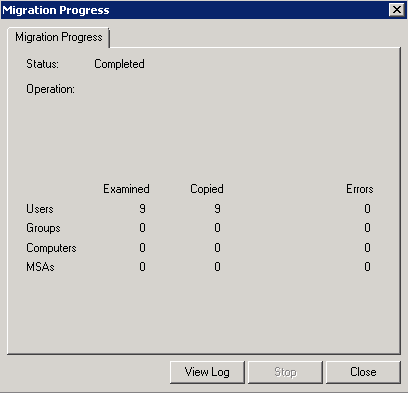 If you click view log you can see that the user object and password has been migrated. 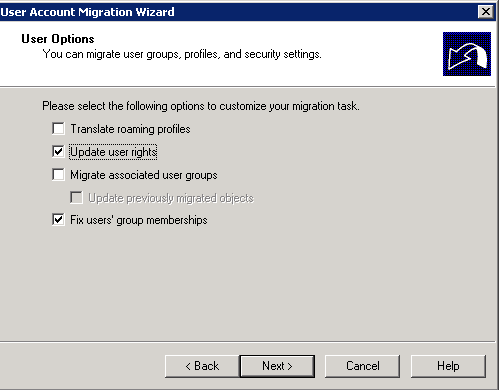 As we previously migrated the global group, the user has also been added to that. You can now see the users in the target domain. You are missing one screen shot from this process. It is User Options section of this process. 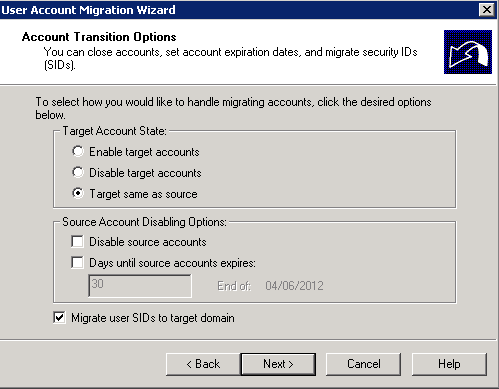 One crucial step you didnt mention is before the migration, login as ADMTUser. If ADMT is not run as ADMTUser, you will get a permission error when trying to migrate them passwords. 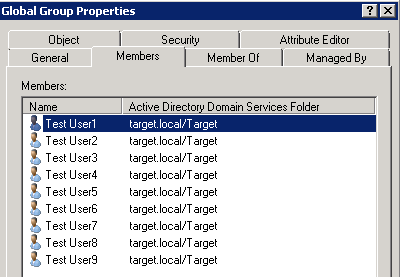 I fixed this error by adding TARGET\administrator account to SOURCE\Administrators group.